Recently, Facebook made it possible for a brand to merge their Facebook Page and Facebook Place to one concise page. This new feature became available the same time as Facebook rolled out the Deals option for Facebook Places, which allowed for various local deals for users checking into a physical location from their mobile phone. It makes sense these features debuted around the same time because both additions can certainly be utilized in conjunction with one another. However, like any newly added feature there are good and bad aspects. What will you decide to do with your brand on Facebook, merge or remain the same? 1. Consistency: The main upside to merging your online presence on Facebook is that it creates a single hub for your customers to interact with your brand and to find information. Having your contact info, location, deals, updates, photos, events and more all on one page offers a helpful streamline for any current or future customer with regard to the goings-on at your company. 2. Convenience: Going hand in hand with consistency, the fact your entire brand is in one spot on Facebook allows for easy updates and maintenance as the owner of your brand. After a merge you only need to update your customer base from one channel within Facebook, which allows for an easy connection to your business’s online presence and physical location. Also, whenever your brand needs to update your profile there’s no need to worry about consistency between a Page and Place, making changing info quick and streamlined. 3. Appearance for Small Business: Another plus to the merge is that it merges the look of a Fan Page and a Places Page, which is specifically beneficial to companies with one physical location. 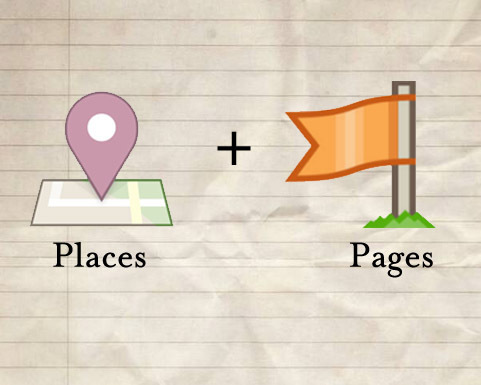 For instance, a small map of your business’s physical location appears at the top of your newly merged page offering quick and easy understanding to consumers as to how to get to where you’re located. Not to mention, your address, phone number, website and hours are now also at the top of the page. This is perfect for a small business like a coffee shop or a shoe store that aims to bring the customer to a physical location. 1. Appearance for Medium to Large Business: Although the appearance of this merged page is not unsightly in any way, it still has a disadvantage for most businesses. If you’re a large business owner, especially with more than one location, then it’s recommended that you do not merge your presence on Facebook. The look of the merged page is overtaken by the map at the top of the page, altering the look of a Fan page that users have come to learn and love. It doesn’t make sense for most businesses to merge because of their type of business. If you were a popular eCommerce site with no physical location, consumers would be confused as to why your contact info and address were front and center on your page. Not to mention, FBML customized tabs are shortened in width after a merge. This will alter any existing custom designed tabs you have within your page, squishing the images and distorting them. 2. Inability to Reverse a Merge: One of the main issues with the new merge feature is the fact there’s currently no option to reverse it once it’s implemented. This is hard to deal with because as a business, especially online, your market and product is always changing. Therefore, not having the ability to alter a facet of your brand may become frustrating and in the end troublesome for the transforming state of your business. 3. Confusion: Facebook appears to still be working on the Places feature and hasn’t fully completed work on the way that Pages and Places merge. My prediction is that they will attempt to fix the above problems in the near future. It’s not like the social media giant to release something that isn’t fully complete and user friendly, but then again like any business Facebook is ever changing. Until the confusion passes, what will you do? Will you merge or leave your Facebook presence as is? The Digital Analytics Association since 2004 has advanced the profession of using data to improve business. Join Bounteous' Ella Nguyen on Sept. 11 for the kickoff event for the DAA Chicago Chapter.